Board of Education members this week got their first look at proposed capital and non-recurring capital projects, including the education specifications for the expansion of Holland Hill School. No votes were taken — those are expected at the board’s first meeting in January — but there was a foreshadowing of possible debate looming over the Holland Hill project. One of the two proposed capital expenditures in 2016-17 is $1.24 million for architectural design, engineering and environmental testings costs that would add five general classrooms at Holland Hill, and also leasing two temporary classrooms during construction. The Holland Hill project, part of the school district’s facilities plan adopted this summer, would make it a “504” school, which would have four classrooms per grade level, with an average class size of 21 students for an overall enrollment capacity of 504 students. Current capacity at Holland Hill is 315 students, according to the school district, while enrollment as of this October is 405. New enrollment projections are in the works, but existing data projects 438 students in 2016-17 and 431 in 2017-18. “We’re adding five general education classrooms, our capacity is 315, but I think that’s probably not a valid number,” board member John Llewellyn said. Fellow board member Marc Patten said that starting with the school’s existing 24 classrooms, and taking away rooms designated for a specific use, such as special education, leaves 15 general classrooms. At a maximum of 21 students per class, that gives Holland Hill a capacity of 315 students. Eileen Liu-McCormick wanted the board to wait for updated enrollment numbers before doing anything with the Holland Hill specs. According to Superintendent of Schools David Title, a full presentation on enrollment projections is expected at a February meeting. Chairman Philip Dwyer said there is a “long lag time” between when the board approves the ed specs and when a building committee is formed. And, Title said, the school board can make changes to those ed specs at any time. 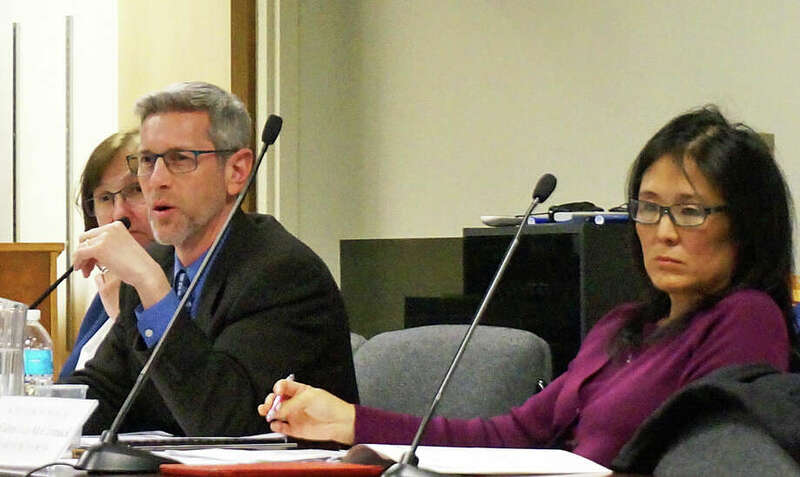 In response to a request from Liu-McCormick, Title said he would ask the consultants working on the enrollment projections if they could accelerate the Holland Hill numbers for January. Patten said it sounded as though Liu-McCormick and Llewellyn were hedging on whether to make Holland Hill a “504” school. Llewellyn also wanted to know if, instead of leasing two additional portables for Holland Hill during construction, the kindergartners could be sent to Riverfield for one year. An expansion project at Riverfield was recently completed. While there may be excess capacity there now, the total number of “empty” seats does not fall into one grade level, officials indicated, so that does not mean there are any empty classrooms for the Holland Hill kindergartners. The other capital project proposed is $3 million to replace 18 roof sections at Fairfield Woods Middle School. The roof warranty expires this year, making the roof project eligible for state reimbursement. Cullen said replacing the roof was not considered when the middle school recently was renovated and expanded because it was still under warranty and there weren’t a large number of leaks. Non-recurring capital projects total $3.17 million and include $2 million for the second phase of security upgrades around the school district. Title said $3 million for security was initially proposed last year, and the town and school board agreed to split funding into two phases.